Did God Almighty prohibit Dogs as pets? In many cultures, dogs are not commonly kept as pets. For some people, their only exposure to dogs may be packs of dogs that wander the streets or rural areas in packs. People who do not grow up around friendly dogs may develop a natural fear of them. They are not familiar with a dog's cues and behaviors, so a rambunctious animal that runs towards them is seen as aggressive, not playful. 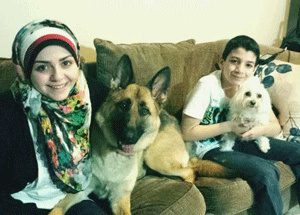 Many Muslims who seem to "hate" dogs are really, therefore, simply afraid of them. They may make excuses ("I'm allergic") or emphasize the presumed ‘religious’ "uncleanliness" of dogs simply in order to avoid interacting with them. The Ahadith corpus provides narratives on this issue which are often found to be in theological tension with one another. In one particular report, one notes the Prophet [allegedly] asserting that angels do not enter a house which has either a dog or a picture within it. Another finds the Prophet [allegedly] ordering that dogs should be killed. In another, one finds the loss of a reward for one's good deed each day if a dog is kept in the home (barring exceptions). To the contrary, a prostitute is found forgiven by God for providing water to a thirsty dog about to die by removing her shoe and tying it with her head-cover to draw water out of a well. In yet another, one notes that dogs used to urinate and pass through mosques at the time of the Prophet and water was never sprinkled over the dog's urine. All animals as part of God's beautiful creation belong to Him and will return to Him after their death. Many Muslims are aware of the Quranic narrative of the cave sleepers of Chapter 18 (Surah Kahf) who had with them a dog that also slept with them for hundreds of years (God alone knowing exactly how long 18:26). Not only did God keep the sleepers safe, He also kept the dog safe allowing it to stretch its paws over that prolonged period (18:18). These sleepers were righteous folk and were truly guided aright (18:13). There is no sense of any sort of prohibition against dogs in this narrative of the Quran. This is also not the only mention of a dog in the Quran. Apart from the parable encountered in verse 7:176, the scripture also informs the reader that a hunting dog's catch is lawful (Arabic: uhilla) to consume as food. No doubt, dogs would have been trained to hunt and catch their prey with their mouths. This poses considerable difficulty with the popular Muslim assertion that dogs are impure to the touch, yet the food they catch remains lawful for consumption. Popular translations such as the one above make use of the terms 'hunting animals; beasts, birds of prey, hunting creatures, falcons, predatory animals' as a translation of the Arabic term 'Mukalibeen'. Arabic speakers will no doubt be familiar with the term ‘kalb’ in general Arabic parlance which refers to a dog. This is no different from how the classical Arabs also understood the term. The Quran clearly informs its readers that the righteous men of the cave (In Surah Kahf 18) possessed a dog that slept with them in the cave. • Would the angels not have entered the cave where the dog lay?
. Would the spiritual reward of these pious exemplary believers diminish due to their sharing their new abode with a dog? • Why did God protect the dog allowing him to stretch his paws (18:18)? • Why was a statement not made in these verses with regards the claimed impurity of the dog or in fact, at any place in the Quran? • Why does the Quran in verse 5:4 clearly inform its readers that the food hunted by dogs is lawful (Arabic: Halaal) for consumption if it is (as claimed by many Muslims) unlawful to touch such a creature? • Why do translations attempt to hide the true meaning of the word 'mukalibeen' from verse 5:4 and translate it to other than its proper meaning or significance? Or is this a clear example of theological interference with the Quranic text and deliberate obfuscation? If dogs are prohibited and ‘religiously’ dirty, would God speak of those dwellers of the Cave (who had a dog) as good believers?